It’s easy to make chili for hot dogs in your slow cooker. Is a hot dog a sandwich if it is served on bread and eaten with two hands? 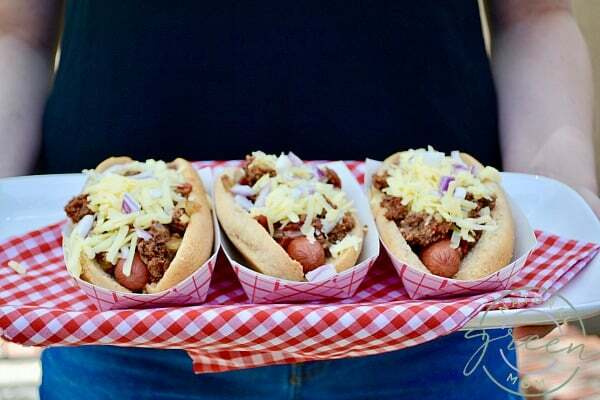 I’m not sure how a hot dog is classified, but I am sure summer wouldn’t be summer without at least one delicious hot dog topped with chili, cheese and onions. When shopping for hot dogs, look for brands that are nitrate-free or uncured. 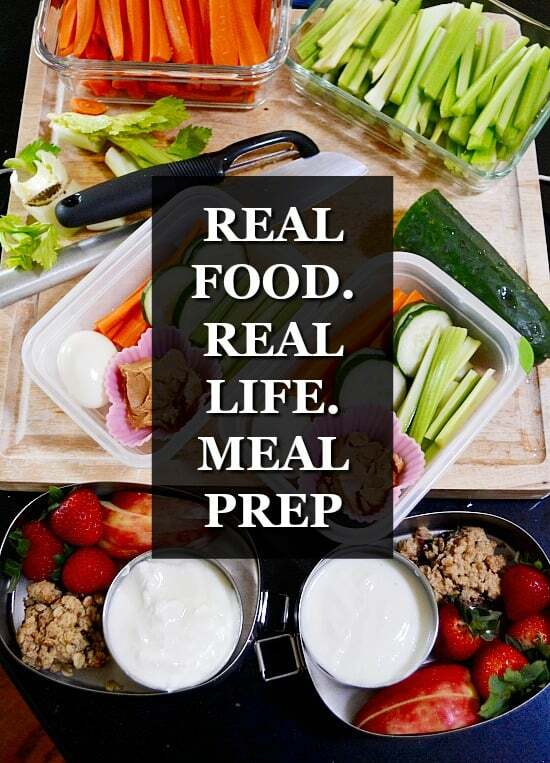 I’d also recommend reading the nutritional facts and aiming for 150 calories or less, 3 grams of saturated fat or less and 370 mg of sodium or less. Applegate is carried in most major grocery stores in case you’ve never discovered them. When I’m trying to eat “lighter”, I opt to sub in turkey dogs and ground turkey. However, the classic recipe calls for beef dogs and lean ground beef. 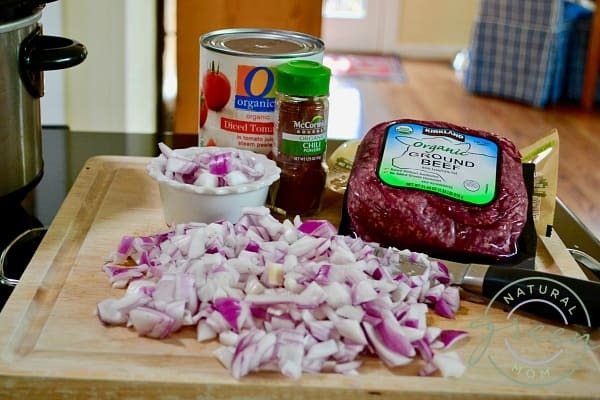 Since the beef cooks in the slow cooker, you may want a lean ground beef – like 95%. Otherwise, you may want to skim the fat off the top of the recipe before serving. Chose to make this recipe with turkey or beef – whichever you think your family will eat. The texture of beans in a hot dog chili is just wrong, wouldn’t you agree? For that reason, this hot dog chili recipe is made with no beans. 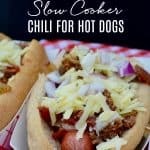 Once you discover how easy it is to make hot dog chili in a crockpot, this recipe is bound to become a summer staple recipe. Another bonus is this recipe feeds a ton of people and can easily be taken to a potluck. In fact, if you were to invite me to a summer potluck, I’d be torn between bringing this dish and my lemony pasta salad for a crowd. 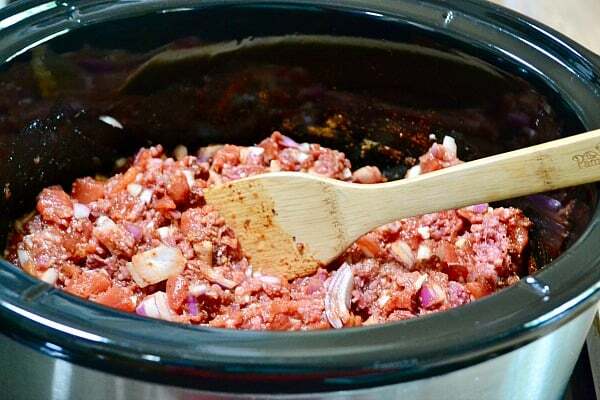 Place tomatoes, chili powder, cumin, red onion, pepper and ground beef in crock of a slow cooker. Use a spoon and mix well - breaking apart the ground beef. Cook on high 4 hours or low 7 hours. About 10 minutes before serving, add the hot dogs to heat through. Serve each hot dog on a bun topped with plenty of chili and optional shredded cheddar cheese. Chili dogs are best eaten outside at a BBQ or picnic, making this recipe perfect for Memorial Day, Fourth of July, and Labor Day. Oh gosh! I just thought of another perfect occasion for this recipe! The sports team table! The years and years of sporting events I attended where we potlucked for lunches and dinners. 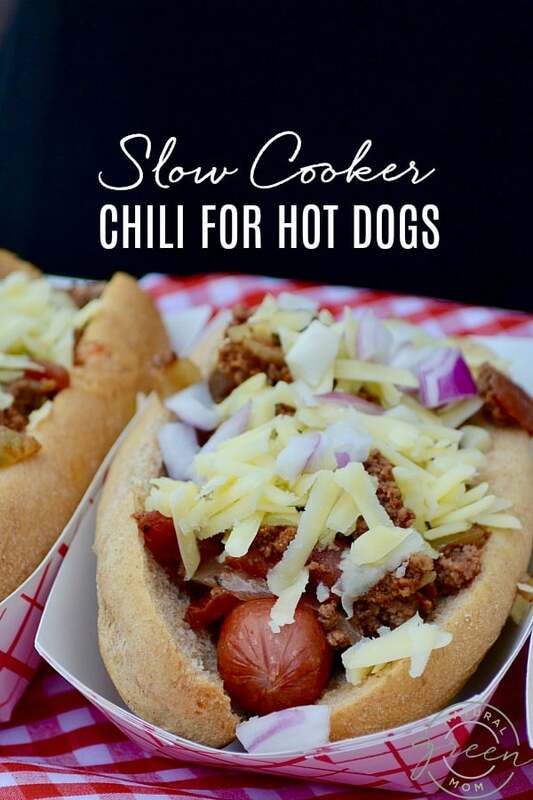 A slow cooker full of chili dogs was always a hit!